Haven High School's annual prize giving in 1998. * There was concern an upcoming show by hit group Hot Chocolate at Boston’s Haven Cinema would be cancelled. An alternative angle from Haven High School prize giving in 1998. Can you see yourself better in this one? 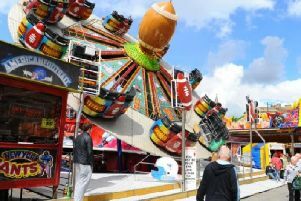 Boston Borough Council said that if arrangements at the venue were not put right to the satisfaction of its environmental health officer it would call the show off. Haven directors dismissed the council’s complaints as trivial and pledged that ‘Hot Chocolate will go on’. It followed concerns over arrangements at a recent Shakin’ Stevens concert at the venue. * Seventy-six years after it was opened, Boston’s head post office, in Wide Bargate, was officially re-opened following renovations costing almost £400,000. The work had seen the entire ground floor refurbished, heating installed, and customer space increased by at least two-and-a-half times. The premises now boasted carpet tiles, making Boston the first town in the Midland region to have carpeting in its head post office. Other additions included: a single-queue system (described as potentially slower, but fairer); two more positions than before; a large mural depicting a ‘roofscape of Boston; and for wheelchair users, a slope to the entrance lobby. * Boston’s Haven Cinema was facing demolition. Owners Castle Square Developments had put in a planning application to demolish the South Street building, formerly the Odeon. The business has bought the building, which dated back to the 1930s, from the receivers the previous year. Among the options being considered for the site was a new sorting office for Royal Mail, which was having to relocate from Main Ridge West to make way for the Pescod Square shopping centre. * Pilgrim Hospital was set to get a new A&E department and a major facelift thanks to a £11m Government grant. Work on the new £1.9m building was due to start the following year. The funding would also allow for the exterior of the hospital tower and theatre blocks to be renovated, including the replacement of windows and heating systems and extension of a ward.